With the advancement of DCIM offerings, users are starting to achieve marked success in deploying an overarching software solution to pull together their data center in a pane of glass. Given the need for capacity planning, infrastructure monitoring, executive visibility, reporting, compliance and more DCIM is offing a solution that is driving efficiency within the operations space. 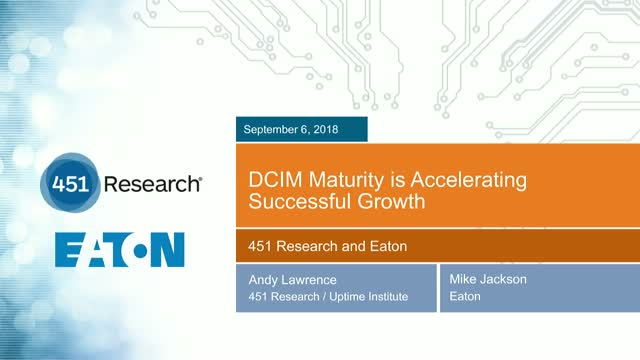 Join our webinar to review what are some key factors to successfully deploy and value that is driven by DCIM in today’s market. Data is a company’s most-valuable resource, but only if the value can be unlocked. For most companies, Machine Learning is the key to unlocking that value. It may still be the early days for machine learning technologies, but nonetheless, companies are still making big strategic bets on how they are going to run their businesses in the coming era of smarter software, both in terms of acquisitions and implementation. For a comprehensive look at machine learning – covering everything from the technological underpinnings to the financial outcomes in the sector – join 451 Research’s Research Vice Presidents Brenon Daly and Nick Patience for a webinar on Dec. 12 at 11am ET as they make sense of the machine learning market including how some key tech acquirers are participating in the rapidly emerging market. Additionally, they’ll take a deep-dive into the machine learning technology itself, and how IT professionals are actually leveraging it. Planning for the future is a complicated business. Organizations have to align business objectives with market forces and the technology that they hope will support them. Early stage technologies can offer tempting options, but it can be hard to quantify the risk in using them. 451 Research has distilled two years of conversations with their clients, demand-side research and the insight of their analyst team into a planning framework that can help organizations take on the future on their own terms. It’s not a quadrant, a wave or a platform. It doesn’t admonish you with prescriptive technology imperatives. It’s our collective view of the most important factors shaping tomorrow, so we can begin to plan today. It outlines trends that are pushing them and the assesses the maturity of the technologies that are behind them. We have identified four key "forces" that define all the trends we foresee: Universal Risk, Invisible Infrastructure, Pervasive Intelligence, and Contextual Experience. Whether you’re an enterprise, a vendor or a service provider, these forces, together or in part, are rocking your world, and 4SIGHT is an essential tool to plan for better future outcomes. This webinar will look at 4SIGHT capabilities and some of the outcomes that it can achieve, and explore some examples of 4SIGHT dialogs. Join us and see how you can raise your planning game! Cybercriminals never stop, so obviously the notion of a static username and password won't suffice. Authenticating based on items the user has and biometrics provides a greater security, but hackers keep getting smarter and so must your user authentication methods. In this webinar, we'll discuss the evolution of risks and how authentication technology has adapted for the future. The right MFA solution implemented correctly in your organization can quickly and significantly increase security. It’s the fastest way to easily secure all your users on all their devices at all times. Hyper converged systems are growing in popularity for a number of applications, but are they the perfect solution for all IT workloads? Adopting a Hyper Converged Infrastructure (HCI) offers excellent modularity, but can also have a major impact on storage, networking, update cycles and system management. In this roundtable discussion we’ll be drilling down into the pros and cons of hyperconvergence and highlight the key issues companies should consider as part of an IT plan that will best leverage the modular scale and flexibility offered by HCI. Please join Steven Hill, Senior Analyst of Applied Infrastructure at 451 Research and Matthew Hoeg, Sales Engineering Manager at EchoStor Technologies for a frank discussion about matching HCI to the right business applications and an opportunity to have your own questions answered. Digital transformation is accelerating for every company in every industry, everywhere around the world. As a part of this necessary transition, people, software and machines are creating and consuming data faster and in more distributed locations than ever before. According to the second annual Global Interconnection Index (the “GXI”), a market study published by Equinix that analyzes traffic exchange globally, Interconnection, or direct and private traffic exchange between key business partners, is becoming the defacto method for companies to operate in today’s digital world. 451 Research Chief Analyst Eric Hanselman and Equinix’s Steve Madden will discuss how major macro, technology and regulatory trends are converging to form an unprecedented era of complexity and risk and forcing the integration of physical and digital worlds requiring Interconnection. Database workloads were, initially, comparatively slow to move to the cloud, but as the pace of enterprise cloud adoption accelerates 451 Research Voice of the Enterprise studies show that the relational database is now the most popular public cloud service currently in use – and seven of the top 12 public cloud services are data-related. As increasing volumes of data are generated and stored in the cloud, data processing and analytics workloads are also rapidly being drawn to the cloud, particular to support new data sources and applications, including IoT devices and stream processing, as well as machine learning. The majority of existing database workloads continue to run on-premises, however, and enterprises need to understand the benefits and challenges of running database workloads in the cloud, as well as managing data across hybrid environments – including on-premises datacenters, the edge, and multiple cloud environments. With so many new options available to IT professionals, it can be easy to lose track of the ultimate goal of technology; which is to serve the needs of business by providing insight, improving efficiency, increasing productivity, and targeting new markets. Today, most everyone is in a digital transformation mode of some sort; but we believe there is a better chance for long-term success if based on a comprehensive digital strategy that can serve as a roadmap for making intelligent choices that will fit seamlessly together over time. Advanced technologies such as hybrid cloud, software-defined infrastructure, AI/ML-based analytics, and evolved data management are powerful tools that are now available to companies of every size; but getting their full value for your business requires planning, foresight and communication. You are cordially invited to join Steven Hill, Senior Analyst, Applied Infrastructure at 451 Research and Vinny Lee, Chief Strategist at EchoStor Technologies for a roundtable discussion on creating a digital strategy that can leverage the evolving nature of IT infrastructure and data management in an increasingly hybrid IT world. •The maintenance of security hygiene is not just an ongoing issue for security and IT teams. It has become a front-and-center concern for businesses worldwide. Some of the world’s most high-profile security incidents of recent months are traceable back to keeping enterprise IT - and the applications on which global business depends - well maintained and secure. This highlights the need for continuous monitoring, update and maintenance of systems such as ERP. •A resurgence of compliance concerns has also risen to the fore. Ongoing requirements such as SOX continue to demand enterprise attention, while more recent mandates such as GDRP require new vigilance and highlight the importance of automating compliance and audit reporting. •The behavior of people has become one of business’s top security priorities, reflecting the impact of everything from insider threats to phishing attacks, account takeover and credential compromise. These threats can have high impact on the business when they target enterprise application systems the business relies on as its lifeline to critical operations – or when enterprises leave themselves exposed through gaps or drift in effective management of configuration and access control. ERP applications are among the most valuable assets organizations have and require specialized attention specific to their requirements to protect the business against these concerns. Join this webcast to hear from Scott Crawford, Research Director for Information Security with 451 Research, and Onapsis on how you can combat these common security challenges and ensure that the business-critical applications that house an organization’s crown jewels stay secure. Service Providers are no longer just purveyors of compute and storage; they are now seen as partners for services beyond basic infrastructure and key allies in hybrid architectures. As such, vendors are now paying more attention to this increasingly important buying center. 451 Research launched Voice of the Service Provider to both qualify and quantify buying behaviors, business drivers and strategic priorities for the expanding universe of public cloud providers, hosters, MSPs, Telcos, Systems Integrators, SaaS companies, and Colos. According to the latest open source security research report from WhiteSource, “The State of Open Source Vulnerabilities Management” for 2018, almost 97% of developers rely upon open source components in order to develop their applications nowadays. But with the recent spike in disclosed open source vulnerabilities, the question arises whether security and development teams have the right strategy in place in order to meet their security objectives? Join retail experts from 451 Research and the payment platform Adyen, to learn what customers are demanding — with a focus on the next generation of shoppers — when you join this live event. The nature of work is being entirely transformed by innovative new technologies. Catalyzed by businesses looking for greater strategic and operational agility and by the techno-empowerment of individuals, ownership over work execution is decentralizing away from IT and other centralized teams of specialists. This shift requires new understanding and new language. At 451 Research, we use the term ‘liquid enterprise’ to describe the massive responsiveness to changing market, customer and user requirements that the most innovative enterprises are looking to give affect to. ‘WorkOps’ describes how the nature of work is changing to make this possible – with intelligence, workflow automation, collaboration and reporting embedded and flexibly tessellating across the work execution lifecycle. WorkOps is opening up new possibilities for collective and connected yet highly personalized experiences that will supercharge work execution and drive employee engagement. It’s also giving rise to what we believe is a new enterprise software archetype we call the Workforce Intelligence Platform. This radically different future for work is significant enough for us to have to rethink the archetypes we use to understand and describe work. •What does the future of work look like? •What are the technology trends underpinning how work is changing? •How should you be thinking about employee engagement? •How do you leverage AI to improve work execution? •How can you become ‘liquid’ and put in place for WorkOps practices? In order to drive growth and deliver on the promise of digital transformation, businesses today must be agile. And they expect their IT teams to be able to embrace and successfully execute change. In this webinar event, Melanie Posey, Research Vice President and General Manager, Voice of the Enterprise at 451 Research, will discuss recent survey findings about the shifts in cloud adoption, what’s driving workloads to the cloud – and what research shows is standing in the way of successful cloud migration and adoption. To confront the challenges and accelerate cloud adoption, experts at TDS recommend that you adapt a dual approach. Move the mobile workloads first and then tackle the complex applications that require greater planning and coordination. The migration of complex apps causes many projects to stumble and lose momentum. But the TDS team will share insights on what it takes to orchestrate a migration project and showcase a new software platform built specially to solve these issues. Join Melanie Posey and TDS experts, Andy Smith and Eric Kraieski, for a crash course on how to plan your journey effectively and smoothly utilizing exciting new migration planning strategies and tools. After watching these experts discuss the details, you’ll learn how the journey to the cloud can not only be accelerated but can establish a resilient and business-aligned IT organization that will withstand the changes ahead. Join us for some insightful discussion, use-case examples, and tips for getting started with these new strategies for cloud migration. Sign up today. Europe is seeing an influx of US organizations keen to establish or expand operations across the region for a diverse set of reasons. Many face challenges, from understanding new business cultures and data regulations and the service provider landscape, to knowing where IT should be best positioned to scale for new technology adoption. We surveyed 250 US organizations seeking entry into - or expanding across - Europe to get a deep understanding of the issues that could delay actions in Europe today. In this webinar, we will draw upon these results to discuss not only the challenges these organizations face but considerations that should be top of mind for companies wanting to simplify and futureproof rollouts across Europe, a market that provides great opportunity for those that can deploy their IT assets right. Moving to software defined infrastructure is all about getting rid of rigid system silos that can hold companies back from digital transformation, replacing them with more fluid resources that provide the flexibility and agility required to support a rapidly evolving mix of existing and new cloud native workloads. It’s the direction of travel for most enterprises and service providers alike. But how do you get there? 451 Research has identified a core set of essentials for companies looking to become software-defined organizations. In this webinar we’ll examine these principles, explore their importance to IT decision makers, and look at the new cloud native workloads and modern DevOps processes that they enable. Join us to hear from John Abbott, co-founder and distinguished analyst at 451 Research and Jennifer Kotzen, Applications Delivery Solutions Team Lead at SUSE. SMBs make up 95% of all businesses globally and employ 70% of the workforce, yet their productivity is typically lower than large enterprises. Embracing mobile is the ideal lever to improve their competitiveness, and this is indeed what is happening. SMBs are ramping up with those saying they are moving from experimenting to investing more heavily in mobile technologies jumping from 44% to 50% in just the last year. •Why SMBs stand to gain big from mobility and how they can succeed in their mobile journey. •How to think through mobile strategy, security, governance, user engagement, processes and business model innovation. •The pitfalls to avoid and questions to answer at each stage to get the most out of mobile. For decades people have been talking about self-service BI and analytics to enable business users to make better decisions in organizations. Yet, the big data era (Hadoop, Spark, data lakes, and more) has seemingly pushed us in the direction of automation, machine learning, and AI. Are your business users left out? Do they still ask for more control over reporting and analysis? What if you could provide the simplicity of Internet search for ALL users on ALL of your data in the organization? What if you could do all of this and provide security and privacy with the full power of visual analytics? •Why modern analytical environments need to focus more on business users. •Why traditional BI approaches are falling short. •How new innovations like search-based BI are redefining self-service BI. The best-run datacenters are those where managers have accurate and meaningful information about their datacenter’s assets, resource use and operational status, from the lowest level of the facility infrastructure to the higher echelons of the IT stack. These datacenters use industry-specific datacenter infrastructure management (DCIM) software. Hyper-competition and digital-first initiatives are forcing organizations to reconsider how they do business. ‘Digital transformation’ has emerged to engage customers, improve efficiencies, and fend off threats from rivals. It’s driving the need to rethink application design that delivers information in context and automates tasks across diverse digital devices and touchpoints. APIs have emerged as integration enablers, and their value and proliferation require they be managed as strategic assets. This calls for a lifecycle management approach to API development in combination with intelligent run-time capabilities of an enterprise-class API architecture. Lifecycle management must include strong governance over use that can track and audit changes, policies, and dependencies critical to enterprise security, governance, risk, and compliance (GRC) practices where monitoring is a critical run-time function for secure and successful API platform implementations. •Defining the lifecycle management and governance practices required of APIs as accelerants to digital business initiatives. C-Level executives, enterprise architects, developers, integration and API professionals alike will learn how to reconsider their integration strategies and toolchains to become core enabling assets for their emerging digital business’. 451 Research is your radar into the business of IT innovation. Whether you are a product manager investigating the competition, an IT decision-maker evaluating the impact of emerging technologies on your business, a service provider finding your place in an evolving industry, or a dealmaker fueling the digital economy, 451 Research gives you the inside track on your business and your markets.